Is this the best banger barge you can buy? If you’re a tightwad where cars are concerned, want something a cut above your average Forxhall and want to spend less than £4,000, what do you open your wallet for? How about something that’ll carry five people (and their luggage) in comfort at motorway speeds all day, will do 30mpg (if you’re as light-footed as a cat) and will rinse a Porsche 928 (if you’re not)? The clear choice? A W211 Mercedes E500. 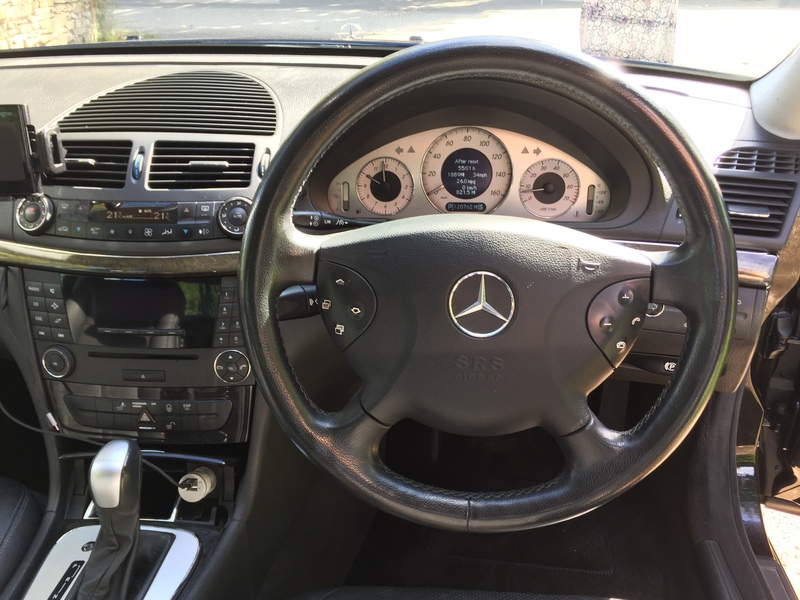 The scare stories about early noughties flushable Mercedes’ build quality has meant these cars are now daftly cheap for anything with four wheels and an engine, let alone a car that’ll see 0-60 in less than 6 seconds and 100 in just under twice that. The reality is that most of the problems on your W211 will have been sorted and for those remaining there are plenty of specialists around. The ‘finest car you can buy in the real world’. The Telegraph bullseyed it at the E500’s launch when they called it “…probably the finest car you can buy in the real world.” And it’s now yours for under six months payments on a used Golf R32 – a car that’s less than a second faster 0-60 and has fewer horses. Even Scrooge-spec cars give you electric seats, aircon, heated front and rear windows, auto lights, wipers, cruise, dipping mirrors and a handy speed limiter. The full list of options makes Chatsworth look like a garden shed. Unless you’re the Queen, the E500’s driver’s seat is almost certainly more comfortable than wherever you’re reading this. Spending a day driving across Europe takes as little effort as nipping out for a paper. It’s simply because the E500 is a combination of screwed-down, bolted-to-the-road stable and turbine-spooling fast. It doesn’t stray or wander no matter how dreadful the surface, how fast you’re going or the angle of corner. It just goes where it’s pointed. Rapidly. With as much drama as a bible study. You’ll need that limiter. At least until you get used to the E500. On your first motorway outing you’ll wonder why lane three has turned into Day of the Bimbling Undead until you look down and see the sort of numbers that usually come from dilithium crystals rather than 95RON. And it’ll be so quiet as you casually beast those Audi-borne photocopier reps that you can listen to Radio 3 on the Harmon Kardon stereo as though you’re sat on your sofa at home. Looks dull, doesn’t it? Not when it’s moving. The E is easier than an automatic Micra to drive – and drive blisteringly fast – because its underpinnings are properly clever and do the thinking for you. You get near as dammit all-aluminium suspension with a four-link front end and multi-link rear. The bits of the suspension that aren’t aluminium are Airmatic. Airmatic is suspension that could get a job lecturing in engineering. It’s clever enough to constantly compute your ride height, the best stiffness for the air-springs and the amount of damping you need in each of your four shock absorbers. And it does it twenty times each second. For each wheel. The result? A car that carries far, far more speed into, through and out of corners than one on a conventional set of boingy bits. All without even rippling the surface of your coffee. On launch, Airmatic was wallet-rippingly expensive to fix. It’s still not cheap, but it’s not ruinous if it lets go and you get a saggy corner. And, it’s worth every penny. The stiffness of the body and structure help – 18% less wobbly than its predecessor. The bonnet and boot and bumpers are all aluminium stampings, as are the E500’s internal sections, so the car is lighter than you’d think. The remaining bits are high-strength steel with panels variably precision-stamped so that there’s an ideal balance of thickness and strength. But the jewel of the car is the motor. The 5.0 litre V8 lump sees 306 BHP coming in at 5600 rpm and 339 ft·lbf of torque between 2700 to 4250 rpm. It’s not pretty to look at, but the only place you’ll be looking when it’s running is up at motorway bridges for talivans. You can make the mistake of thinking at lower revs there’s not a lot of action, but the speedo proves you wrong as the only sound you’ll hear is the local speed camera partnership chuckling as you fund their Christmas party. At Manoir aux Quat’ Saisons. To get the same power output as the E, you’d need a Nissan 350Z, a £45k BMW 435d xDrive M Sport or a £51k Audi SQ5. The Golf R32 gives you 60 BHP less and a measly 236 ft·lbf. Even the BMW Z4 puts out nearly 80 BHP less. But it’s the torque that really makes this car so effortless on the road. The E500 dishes up the same torque you’d get from an F Type or a 2018 Porsche 911 GT3 (seriously, check it). Even the torquemonster Audi R8 only puts out 59 more ft·lbf. It’s not all grunt and shove though. Reassuringly, some owners even asked for their 5.0 litre V8s in Euro IV compliant spec, so you can tootle around Mayor Khan’s ULEZ with the lycrasti waving and blowing you kisses as the V8 barely ticks over. Everything you need. Nothing you don’t. And a very pleasant place to be. 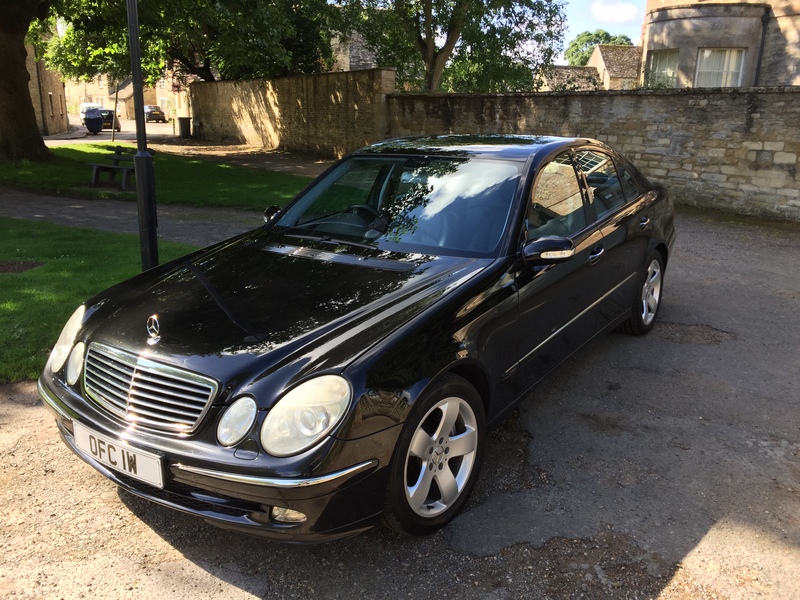 If the standard 5 litre E500 is a bit dull for you, try hunting out the 6.2 litre E63 AMG. But good luck pinning one down for £3,500. You’ll need around four times that for a good one. Less than you think. The E500 is definitely not an economy car, but most economy cars won’t reach 155mph. Remarkably though, the running costs aren’t anywhere near South American dictator levels. Drive like Mother Theresa’s conscience and you’ll see 31mpg on a motorway run. Drive normally and you’ll get a decent 27mpg on boggo 95RON. The W211 does have an appetite for tyres though, and, if you’re smart, you’ll buy premium rubber. Pirelli P7 Cinturatos (Cinturati, surely?) suit the car, are sticky enough and last reasonably. Apart from that, the early W211s have a habit of being a little faultcode-happy, so it’s worth investing in a tool for finding and re-setting them. Drop into a dealer and ask them to do it for you and you’ll probably have a long wait and a chunky invoice. Or, for less than the price of two tanks of fuel, you could get something like an iCarsoft i980 tool and DIY to your heart’s content. If you’ve got this far, you probably share a love for fast, cheap old sheds. So welcome, you’re in good company with fellow addicts. 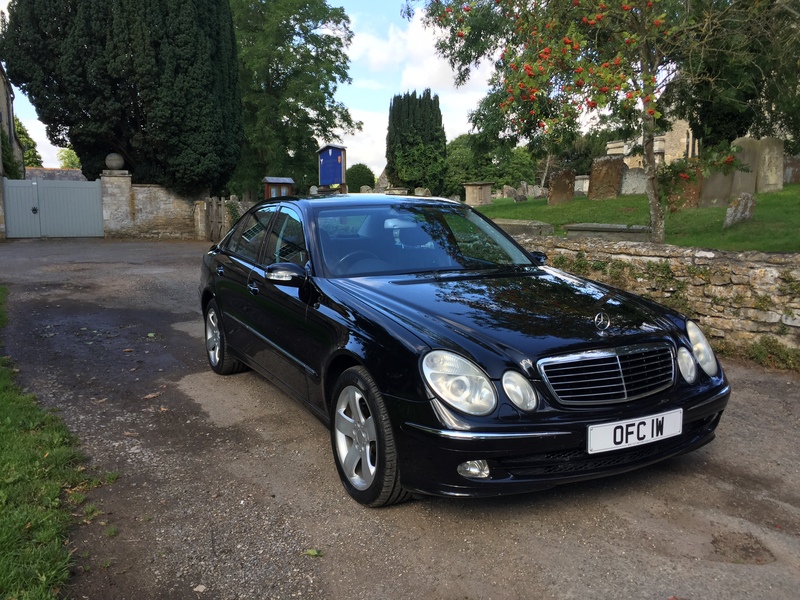 If you’re looking for a cheap runabout to take you to work and back in your local town, the E500 is probably not your cuppa. The V8 will never warm up, the urban fuel consumption will ruin you and it’ll be no fun. Get a Fiat Panda 100hp instead and grin your way to work. If you do a decent bit of motorway and fast A road mileage and want something comfortable and safe to do it in, the E500 is absolutely for you. Q-car quick, there aren’t many things out there that give you quite so much for so little outlay. You’d have had to stump up nearly £40k for one of these in 2003. Now, you can walk away with the keys for £3,500 or less. That’s got to make it one of the best bargain barges you can buy. It might even be the quickest. Even better, go anywhere near an airport or any conference centre and you’re guaranteed someone will hail you and press money into your hand for the ride home. → Let the passengers take the strain.